John has fabricated and is now focused on installing the 1940 Lyman Yacht Tender’s new keelson. One hint if/when it is your turn to do so. Since the keel, and the keelson are bowed, they must be joined on the hull. While the difference in radii may appear small, there is a difference that will keep the rudder shaft, prop port and other components from lining up if the bores and fastener pilot holes are drilled and fasteners are driven in while the assembly sits on flat surfaces like work tables or saw horses. John and I first positioned the keelson correctly along the ribs’ lower extremities and drove a half dozen or so temporary screws through the ribs and into the keelson. We then laid the keel in place, clamped everything together and drove position-holding screws through the keelson and into the keel. Only then were we able to bore rudder shaft and other ports through the new keelson. We then removed the temporary screws passing through the ribs and into the keelson, which released the entire assembly. 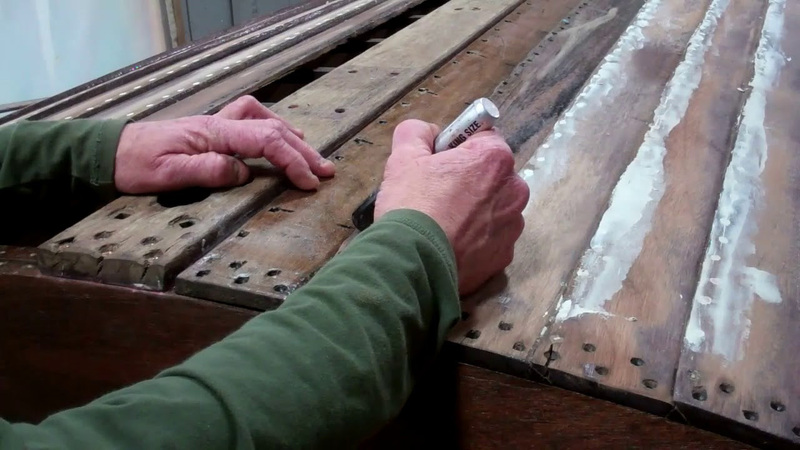 It will be separated, receive a final application of CPES and then the keel and the keelson will be joined, yes, again on the hull, with a generous layer of 5200 “frosting” troweled on between the two planks. Installing the garboards completes the replacement process, but cannot happen until all remnants of the old clench nails are removed. We will finish fairing her below the waterline and John will complete the work needed on her stem and knee, and it will be time for Interlux PreKote primer.